The list of places my book has been increases daily! But I've noticed that a lot of the places are tangential at best to astronomy. That's fine, of course, and it's great to see it anywhere. But it does make a certain sense that it should be seen in a cosmic setting, don't you think? So in comes engineer and amateur astronomer Andrew Cooper. And what does he send me? Awesomeness. Hey, wait a second. I use that phrase all the time, but this is the closest it's ever been to being accurate! 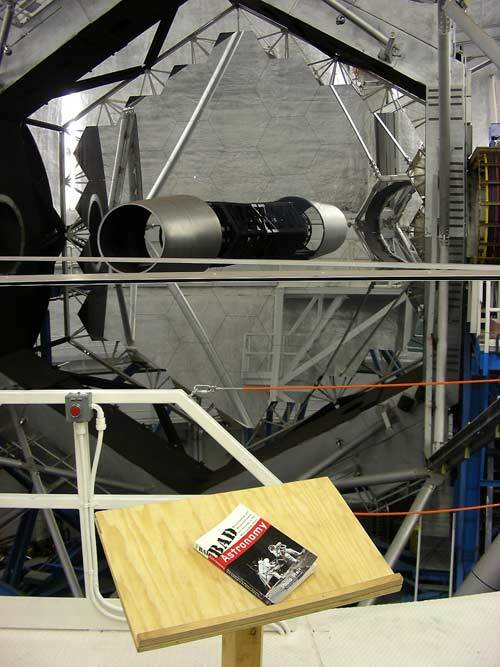 That picture shows my book sitting in front of one of the two monster 10-meter Keck telescopes in Hawaii. It'll take some doing to top that. So where has your copy been? So, do you own a copy of the book? Take a picture of yourself holding it in some fun location, send it to me, and I'll post it here!